Three bombs were set off in the old city of Najaf, among the holiest of Shiite sacred sites on Thursday afternoon, according to DPA. The casualty count is confused, but up to 27 were killed and up to 111 wounded according to this source. The incident comes at a time of renewed Sunni-Shiite tension that could have implications for the Obama administration’s withdrawal timetable from Iraq. Al-Fayha reports in Arabic that one of the car bombs went off near a Husayniya or Shiite religious center, whereas the other two hit the wholesale market. Banat al-Hasan St. is mentioned in some reports. The frightening thing is that the bombs exploded near the shrine of Imam Ali, the son-in-law and cousin of the Prophet Muhammad, who is the first Shiite Imam or divinely-appointed leader of Islam (Sunnis consider him the fourth orthodox caliph). 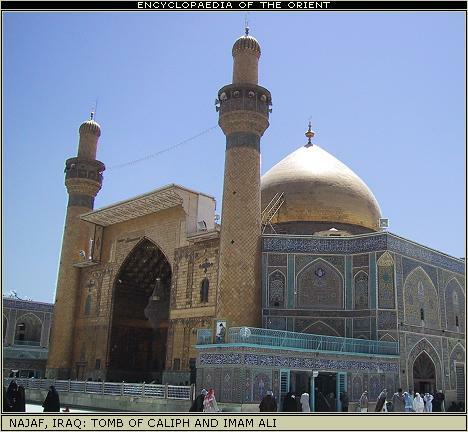 For Shiites, the shrine of Ali is like the Basilica of St. Peter for Roman Catholics. We saw what happened when Sunni guerrillas blew up the Askariya Shrine that serves as the tomb of the 10th and 11th Imams in Samarra in 2006– it kicked off a massive Sunni-Shiite bloodbath. Najaf inhabitants expressed consternation and bewilderment that car bombs could have been allowed into the old city by the Najaf police, who are normally now vigilant against such attempts. The government, as usual, blamed Baathists (followers of the old regime of Saddam Hussein overthrown by the Bush administration in 2003) or Sunni religious extremists (radical Salafis or ‘al-Qaeda’) for the bombings. The blast comes at a time of mounting political tension ahead of the March parliamentary elections. The High Electoral Committee on Thursday disqualified a further 500 candidates and political lists from running on March 7. Just a few days ago, it disqualified 14. Most Sunni Arab Iraqis living under the Baath regime from 1968-2003 had some connection to the Baath government, of only via a cousin, and so did many Shiites (half of the middle and lower-level Baath functionaries in the 1980s were Shiites). Among the more prominent of those barred is Saleh Mutlak, head of the National Dialogue Front, a small secular Arab nationalist party that has sat in parliament and not been known for being disruptive. Norwegian historian Reidar Vissar, an expert on southern Iraq, referred to this development as a ‘complete system failure’ in Iraq’s development as a parliamentary system. Sunni Arab Iraqis are furious about the move, which is seen as promoted behind the scenes by Iran. If the goal of this final year of American military occupation was to achieve communal reconciliation among Shiites, Sunni Arabs, and Kurds, then these disqualifications are a big step back and raise Sunni-Shiite tensions. Mutlak will appeal the ruling to a seven-judge panel. If it is not overturned, his small party (11 seats in parliament) and the coalition of which it is a part, the Iraqi National Movement, may boycott the elections. The Iraqi National List, headed by former appointed PM Ayad Allawi (25 seats in parliament) is also part of the INM coalition, and groups secular Sunnis along with some secular-minded Shiites. Vice President Tariq al-Hashemi is also part of this coalition, despite being on the Sunni religious right. On Thursday, 300 Sunnis came out to demonstrate in Ramadi north of Baghdad, and there were rallies in some other Sunni-majority cities. A Sunni boycott would weaken the legitimacy of the resulting elected government. Since the provinces now function as electoral districts, however, a boycott would not stop Sunnis from being elected. It is just that whoever is elected from Sunni-majority provinces such as al-Anbar and Salahuddin would not be very representative of the electorate. In a mixed province such as Diyala, if the Sunnis boycotted then most MPs will be Shiite, which would affect the sectarian balance of power in parliament. Mutlak says he is confident that his appeal will be successful.. The remaining 110,000 US troops in Iraq seldom do patrols and seldom see combat any more (none were killed in hostile action in December). Their main task is to lock down the country so that the March 7 election can be held without horrific car bombings (Iraqis just have to walk everywhere for three days). Once the election is held, the withdrawal of troops will accelerate, and all but 50,000 should be out by the end of August. These 50,000 will not be combat troops but rather trainers and providers of logistical support to the Iraqi military. A further round of violence between Sunnis and Shiites over what Sunnis will claim is a stolen election fostered by an unfair vetting process could complicate the US withdrawal. The Shiite government does not control northern Sunni cities such as Mosul (pop. 1.7 million), which are armed and devoted to the Arab nationalist principles now being dismissed as ‘Baathist’ by the fundamentalist Shiites who control the government. The conflicts between the Kurds and the Arabs in the north have still also not been settled by negotiation, and they could easily flare into violence.